Over the last 6 or so months I have started reading novels to Mr 7. A few years ago I started reading Charlie and the Chocolate Factory to him, but he just didn’t have the staying power to concentrate on a story with minimal pictures. He’s at the perfect age now though and we’ve started enjoying a great range of books. We started off with the Treehouse series by Andy Griffiths and Terry Denton (if you are a writer then you will love the first book in the series). This book ignited Mr 7’s desire for books that were a bit longer. I’ve also begun to notice that reading novels with him seem to help him settle in for sleep easier. With our history of sleep problems, anything that helps is a blessing! Our most recent read was part of the Middle School series by James Patterson. I bought this book because I love his books written for an adult audience and wanted to see how that would translate to a younger reader. I’m happy to report that his talent really shone through in this laugh out loud novel. What was your favourite part of Rafe’s Aussie Adventure? The part with the Bunyip and when the drop bear came to Rafe. What was your least favourite part? Actually (this is his word of the moment) I liked all of the parts. What did you like most about Rafe? I like that his second name was Kat and that they said his name funny sometimes. I like Rafe and the Bunyip. Who do you think would like to read this book? People who like explosions and who like Bunyips. Maybe when I get older. How many fist bumps out of five would you give Rafe’s Aussie Adventure? Five because it was a good book! 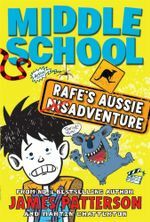 If you would like to purchase Rafe’s Aussie Adventure, Booktopia is has it on sale here. Sharing stories with Mr 7 is probably one of my most favourite parts of being a parent. It makes me so happy to see him enjoy reading and being read to. Do you read with your kids? I don’t think I knew that James Patterson wrote books for kids! Or if I did, I forgot. Gotta love Andy Griffiths for getting boys excited about reading. I love all these books for getting the non reader into reading…. Haha drop bears! My favourite books as a kid were choose your own adventures. There’s so many cool books around these days, though. I find myself loving most of the books my kids bring home. I will have to check if my boys have read this one. We’re in the throes of the Roald Dahl’s at the moment, currently on The Great Glass Elevator. I’ll check these out next! My step son really loved the James Patterson books. I had no idea he was writing for kids, so I was pleasantly surprised! I loved reading with my kids and we continued with it long after they were capable of reading books themselves. There’s a lovely companionship and bonding that goes with reading aloud to each other and it’s fun discussing what we’d read afterwards. My eldest is almost 5 and is just starting to get into proper stories (ones we can’t read in 10 minutes). I’m really looking forward to introducing her to my Roald Dahl collection :). And I love stories that are based in Australia so will keep an eye out for this one! I read Enid Blyton to my twins because they love the Boarding school stories like the Naughtiest Girl series, or the St Clares’ series. They love me reading to them. I love that when we go to library now, Izzy picks out books that she can read, and she is interested in reading them. It’s good to see. I have a Fatty Finn book from when I was a kid, that I loved to read. I hope one day she will love it too. Love that you are reading and so is Mr 7. He’s a great kid by the sounds of his responses!! Reading with and to kids is the BEST ! !